Walking through the curved and cobbled alleys of Souq Saruja, a splendid 800-year-old Mamluk-era neighborhood located outside the walled old city of Damascus, one finds a series of abandoned homes or palaces that once belonged to the city’s moneyed elite. Some were left behind by their original owners because of the current war — others were abandoned because of the high cost of their heating and maintenance. An empty rundown side street of the same palace in Damascus’ Souq Saruja area. Those seized by the socialist governments after 1958 were left to rot, due to corruption and negligence, with no respect for their historic and symbolic value. Briefly and for an entire decade, some of these palaces were bought by Syrian and Arab businessmen and transformed into high-end restaurants or boutique hotels, but that phase ended with the start of hostilities in 2011. Among those to fall in the danger zone is the palace of Syria’s first president, Mohammad Ali al-Abed (1867-1932). The Abed residence was once the jewel of the crown of Damascene palaces, located in the heart of Souq Saruja. Like most of the city’s aristocrats, the Abed family once lived in a large and spacious two-floor mansion that was a piece of Oriental art, brimming with lemon trees, an extravagant courtyard, gushing crystal water, and mosaic-inlaid guest rooms. They were considered among the wealthiest in the Ottoman Empire, with family investments in the Suez Canal of Egypt and the Panama Canal. The son of an Arab-Ottoman aristocrat who was private adviser to Sultan Abdulhamid II, Mohammad Ali al-Abed studied at the Sorbonne University in Paris and briefly became Ottoman ambassador to the US in 1908. 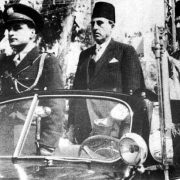 In French-occupied Syria, he ran for president in 1932 and stepped down in 1939, marking the country’s first republican administration that witnessed inauguration of parliament and a constitution. Abandoned and lifeless, the Abed Palace now looks like a ghost house. Giant cracks have appeared in its walls, most of its ceilings have collapsed on hallways and corridors, and all of the handmade ornaments and mosaic have long vanished. Walking up the staircase to the second floor can be dangerous, as it might collapse on the courtyard. Speaking to Gulf News, the present owner, Izzat Al Yagazi, says the palace is 300 years old and that his father Salim bought it from the Abeds in 1948, nine years after the passing of President Abed. He transformed it into the Ahliya School, and took good care of it until it was seized by the Syrian Government in the aftermath of the Six-Day War with Israel. The education department at Al Quneitra, the main town of the Golan Heights, was ejected from the city after the Israeli occupation of 1967 and seeking “temporary premises” in Damascus, they took over the old Abed mansion in Souq Saruja. The temporary stay lasted for 30 years and was only won back by the Yagazi family through court in 1995. During this time, most of its treasures were destroyed or stolen, then sold by antique dealers. The house is currently too expensive to renovate, costing millions of dollars, and equally too expensive to sell in times of war. Abed’s successor, Hashem Al Atasi (1874-1960), hailed from a prominent political family in Homs in central Syria. A three-time president, he ruled the nation as premier in the immediate aftermath of Ottoman rule, once as head of state under the French, and twice during the Independence Era. His father Khalid, the city’s mufti, built a spacious family home in Homs in 1890. It was a strange mix of Arabic and Italian architecture, with colourful floors, ornament ceilings, and high domes in stone. President Atasi frequented this house during his weekends in Homs; this is where he got married and where he died in 1960. Shortly after his death, the mansion was rented out by the Atasi family to a state-run Surgery and Gynaecology Hospital, where it remains until present — decaying from lack of funds and government neglect. Equally troubled is the mansion of Syria’s third president Taj Al Deen Al Hasani (1885-1943), a Francophile who became the head of the state during World War II. Previously, he served as premier in the 1920s and 1930s, and hailed from a prominent family of Sunni Muslim scholars. Despite his family’s religious history, ‘Sheikh’ Taj, as he was known, built a European-style mansion in the Al Halbouni neighbourhood, west of the Hejaz Station, parting ways completely from traditional Ottoman palaces which became démodé in the 1920s. Ottoman-style homes had no windows on the ground floor, after all, their entrances were narrow, and their courtyards way too big to attend to, while their streets were difficult to reach in the age of automobiles. 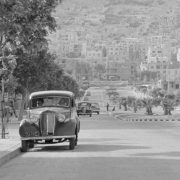 This is where ‘Sheikh’ Taj received Charles de Gaulle during the French leader’s visit to Damascus in 1941. The mansion was seized by the government after ‘Sheikh’ Taj’s death and is currently occupied by one of the city’s numerous security branches, manned with checkpoints and men in uniform. After Sheikh Taj, Syria’s celebrated nationalist Shukri Al Quwatli (1891-1967) was elected president of Syria. 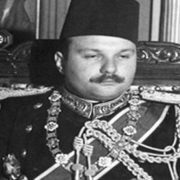 Considered the founder of his country’s independence, Quwatli ruled from 1943 to 1949, and then again from 1955 to 1958, when he stepped down to create the union republic with Egypt. Quwatli’s family mansion in Harika Market at the Sidi Amoud neighbourhood, southwest of the splendid Grand Umayyad Mosque, was destroyed by the French during the bombing of Damascus in 1925. Throughout his career, President Quwatli lived in rented homes, and died in 1967 with no property to his name. One of his rented homes was located in Al Jisr Al Abyad and it currently has a plaque with his name on it — the only such symbol of recognition for any Syrian head of state. The entire street has been officially named “Bustan Al Rais” in homage of President Quwatli. The same cannot be said for President Adib Al Shishakli (1910-1964) who staged three coups in the postcolonial years and served briefly as president in 1953-1954. There is not a single monument, home, school, or park carrying his name — all were wiped out by consecutive regimes that came after Shishakli. His family mansion in the Hourani neighbourhood of Hama, constructed in 1910, was briefly seized by the city’s municipality, only to be legally wrestled back by the Shishakli family, which was planning to transform it into a museum and hotel, prior to the current war. It is now in a bad shape, as most of the family members have left Hama and live either in Damascus or abroad. Al Shishakli’s other home in Damascus, located near the Sufara Cinema on 29 Street, is also government held and currently rented to the NGO of Syrian Custom Brokers. This is the home from which he staged his coups and made it to the Syrian presidency. His ally in politics Fawzi Selu (1905-1972) also served as head of state in 1951-1953. He did not own a private residence, testimony to his unblemished financial history, spending the final years of his life with his in-laws in Hama until his death at a state-run military hospital on the outskirts of the city. The residence was sold by his widow Adiba Al Terkawi to its current owner Abdullah Tayfour in 1974. Syria’s last pre-Baath civilian president Nazem Al Qudsi (1900-1998) was a native of Aleppo, capital of the Syrian North, which is presently being contested by Syrian rebels and government troops backed by the Russian Air Force. Qudsi’s family residence stands near the war-torn Aleppo Citadel, a beautiful neighbourhood now completely destroyed, while his home of the 1950s, located in the ancient Farafrah neighbourhood, north-west of the city is currently in the middle of major battles between the armed opposition and government forces. This is where Nazem Al Qudsi lived when serving as speaker of parliament in the 1950s, before being elected to the presidency in 1961.